There are a number of Marshmallow Android phone users around the world. Most of the Marshmallow Android phone users face insufficient storage space problem on his Android phone. 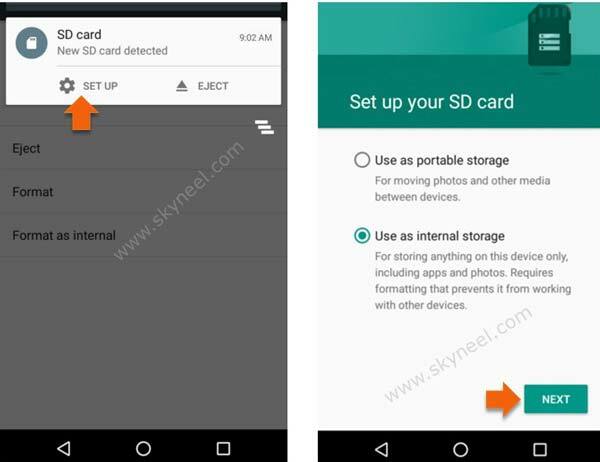 In this guide we have to discuss how to setup SD card as internal storage on Android phone. If you have lot of unused space on SD card but you have insufficient or low storage space problem on Android marshmallow. After reading this guide you can easily convert lot of space to your external micro SD card to internal storage. If you don’t have sufficient space on internal memory of your phone then you can easily setup SD card as internal storage on Android. To do this job there is no need to root your Android phone. You just have to take few simple given steps to solve your problem. Step 1: Properly turn off your Android phone. Insert the SD card into your Android phone and again restart your device. Step 2: Now you get a notification message on your Android screen that “New SD card detected“. Click on the “Setup” option. Step 3: Tap on the “Use as internal storage” and click on the “Next” button in the set up your SD card window. Step 4: Now you must need to format your SD card as internal storage by tap on the “Erase & Format” option. Formatting option remove all the data from your SD card. After formatting this SD card will only work in this device. Note: During the formatting please don’t remove the SD card. Step 5: After finish the formatting process of your SD card tap on the OK option. Now you have another window in which you have two options-Move now and Move later. You can easily move your photos, files and apps to this new SD card. Now you have to tap on the “Move later” option and tap on the “Next” option. Step 6: Tap on the “Done” option. Now, you new SD card is ready to work. You can easily move photos, files, apps and other things to the SD card from “Settings Storage” option. You can easily check storage space from Settings option on your Android phone > tap on the “Storage & USB” option. I hope after reading this guide you can easily setup SD card as internal storage on Android without Root. Now, you have lot of space to store your important data on your micro SD card. There is no need to root your Android phone to using this feature. If you have any query regarding this guide please write us in the comment box. Thanks to all. But this solution can’t work in my samsung galaxy grand prime plus,,what can I do now? Nice info, is it work for kitkat …? Or below ? I’ve lenovo a7000 it’s running out of storage. May u do me some tutorial here… Please…! ?